There are days that I really don’t feel like cooking. That’s why I fill my pantry with items that can easily be turned into a balanced meal with very little effort. Something I always keep around are udon noodles. You can find them in Asian grocery stores in the noodle aisle (for those who haven’t been to an Asian grocery store, yes, there is usually an aisle that’s JUST NOODLES). The ones I buy can be ready to eat after a couple of minutes in the microwave or on the stove. The morning of this lunch, I was feeling particularly uninspired to cook. I basically just threw everything into my lunch bag and put it together at work. Let’s do it!/Lunch it up! 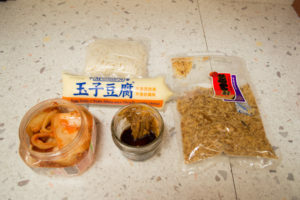 Put the peanut butter, soy sauce and sesame oil in a tight-lidded jar. Pack everything else up and bring it to work. Once you’re ready to eat, slice the egg tofu into 1/2 inch rounds. You will need a sharp knife to pierce through the package. If you’re like me, you keep a sharp knife and a cutting board at work. If you’re not like me, you can do this at home, so you’re not left with half a tube of tofu at work. You can also eat the whole thing. I’m not judging you. Put the udon and egg tofu into a large bowl and cover with hot water. Microwave for about 3 minutes, until the noodles are the softness that you like them at. Shake the sauce jar until it’s well mixed, then pour over the noodles and tofu. Mix well and top with bonito flakes. Not only do they make it look really nice, but they add some complexity and fishiness to the dish. Eat with some veggies on the side, in this case, homemade kimchi that required no heating up or anything.